If you are looking for a quick and fluid Sony PXW-X160 XAVC workflow with FCE, you are in the right place. This post displays a workaround to transcode Sony PXW-X160 XAVC MXF files to AIC files for use in Final Cut Express with optimum performance. You can shoot Full HD (1920 x 1080) videos in XAVC format with Sony PXW-X160, but the new HD experience may probably bring problems to users who want to edit Sony PXW-X160 XAVC footage in FCE. The PXW-X160 records in XAVC using the MXF file format, which efficiently compresses full HD (1920 x 1080) resolution using the MPEG-4 AVC/H.264 CODEC. Color sampling is 4:2:2 10-bit with high-efficiency Long-GOP compression at 50 Mbps, 35 Mbps, or 25 Mbps for broadcast quality images. If for some reason you can not work with Sony PXW-X160 XAVC MXF files in Final Cut Express smoothly, you will need third party software to process file conversion. That means you convert Sony PXW-X160 XAVC footage to a format that your editing program favors before bring them in. For instance, you can convert Sony PXW-X160 XAVC to AIC for FCE. UFUShare Video Converter for Mac is highly recommended to do this job. Now I share the guide with you how to convert Sony PXW-X160 XAVC footage to Final Cut Express friendly format using UFUShare Video Converter for Mac. With it, you can effortlessly encode/re-encode XAVC files from Sony PXW-X160 for smoothly importing and editing in various non-linear editing systems (NLE), including iMovie, Final Cut Pro X, FCP 6/7, Final Cut Express, Adobe Premiere Pro, Avid Media Composer, etc. 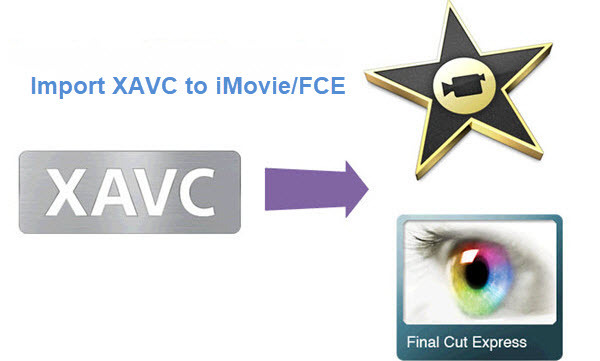 Download it and follow the guide to convert Sony PXW-X160 files to AIC .mov for Final Cut Express on Mac. How to Losslessly Convert Sony PXW-X160 XAVC to FCE? 1. Download, install and run the XAVC to FCE Converter; click “Add Videos” icon to load your source XAVC videos from Sony PXW-X160. 2. Click the “Format” bar and select “iMovie and Final Cut Express -> Apple InterMediate Codec (AIC) (*.mov)” as the output format. This format is specially designed for Final Cut Express, so that you can edit your original Sony PXW-X160 video in FCE perfectly. This profile also works for iMovie. 3. Click “Settings” button if you’d like to customize advanced audio and video parameters like Video Codec, aspect ratio, bit rate, frame rate, Audio codec, sample rate, audio channels. 4. Click the “Convert” icon under the preview window, and the Mac video converter will start converting Sony PXW-X160 XAVC to Final Cut Express on Mac. When the conversion is finished, you can click “Open” button to get the generated AIC .mov files effortlessly. Afterwards, you can launch FCE, and then choose File > Import > Movies to import converted Sony PXW-X160 XAVC clips into FCE for further editing. How to Recover Deleted/Lost Photos from Nikon D800 on Mac?